All homes contain a lot of moisture. Properly controlling moisture in your home can improve the effectiveness of your insulation and resulting energy efficiency. Moisture control methods typically focus on controlling moisture in attics, crawl spaces, basements, and walls. North Fulton Pest Solutions offers many effective home moisture control solutions. Our total moisture control systems include automatic foundation vents, called Temp-Vents®. Temp-Vents® are venting devices which open and close automatically depending upon ambient temperatures. These automatic vents, along with the proper moisture barrier, will help protect the wood in your home’s sub-flooring by reducing dampness. 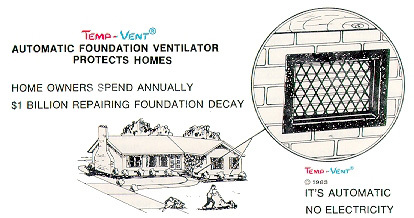 Temp-Vents® also help to minimize the chances of pipes freezing. Each vent has a wire mesh faceplate to block entry of rats, raccoons, opossums, and other animals that often seek refuge in crawl spaces. Our trained technicians can complete on on-site survey and provide you with a free quote on the Temp-Vent® system. The technician will make field measurement notes to determine the number of vents required. A typical moisture control project can be completed in a single day. This system requires no regular maintenance and starts to work for you immediately after it is installed. Read more about our Atlanta Home Improvement Services.